We’re starting into the last week of classes before the Christmas holidays. This week, I always wear my Christmas necktie. Years ago, a former volunteer in the program through which I came to Japan made these neckties for all the guys in the program. It’s a long, large necktie made from cloth patterned with holly leaves and berries — very bright, vivid greens and reds. Some would call it hideous; I think it’s fun and festive, because it’s so obviously Christmas. It’s Christmas shouted from the rooftops — it’s Scrooge after his reawakening running around buying geese for people — it’s the main character at the end of It’s a Wonderful Life — it’s the Grinch swooping down the mountainside, bringing everything back. It’s the exuberance of Christmas in a necktie! Most every year, some students smile at it. A few comment that they like it. A fellow teacher smirked at it last year (in a friendly way). Anyway, at this holy time of year, the walls of the worlds grow thin, and it’s a good time for storytellers to think. Don’t we see this force of ideas on display in many great works of literature? Captain Ahab has this bee in his bonnet and can’t let that whale alone, no matter what the cost. Shakespeare — isn’t there the thing in Othello where the bad guy convinces him his wife is unfaithful, and even though she’s innocent, Othello can’t get the idea out of his mind, and he ends up destroying everything he loves, all because of that one planted idea? The Silmarillion — Feanor wants those silmarils back, and he will take on anyone — Man, Elf, or Vala — who stands in his way. Those are cases where things don’t work out well. But there’s a very positive side to this, too. Take an idea that’s good — a noble theme, a beautiful picture — plant that in the mind, and you’ve done something of service and value. Take Middle-earth. It’s a place familiar to nearly all of us on this blog. We could fill pages writing the things we know about its peoples, its geography, its history . . . yet it’s “only” an idea — “only” a dream. Where is it? It exists in words printed on pages, enclosed between the covers of books. It exists in paintings and sketches done by artists. It exists in musical compositions, plays, and puppet theater. It exists on records, cassette tapes, CDs . . . and yes, thanks to filmmakers, a version of it exists on celluloid and DVDs. We cannot get onto a plane or ship and go there. Yet it is a real land, is it not? It’s far more real to me than Norway, or Brazil, or the state of South Dakota — about those places I know next to nothing. But I know Middle-earth. I’ve spent hours and hours . . . I’ve spent years there! And so have countless other readers, viewers, listeners, and dreamers, both in this generation and in the generations of the past. Yet Middle-earth began as a dream in the mind of one man . . . The dreams I have at night seem to be forged of memory, emotion, the machinations of my subconscious, and perhaps at times an element from outside, the hints and utterances of the Divine — but I don’t think I want to go there in this post. The dreams I have in the daytime — my writerly dreams — are forged of much the same things, with a bit more conscious shaping and/or interference, which is both a good and a bad thing. I was thinking of the storm cellar in our side yard back at the house where I grew up. 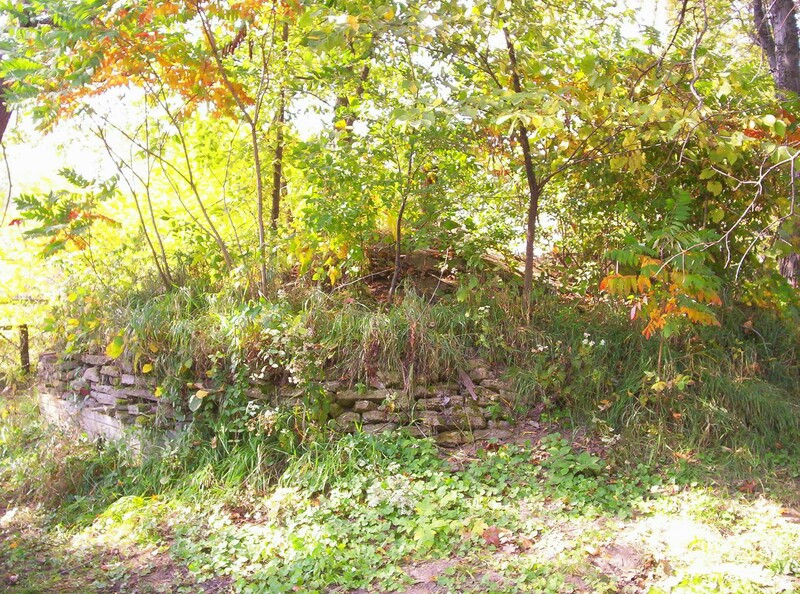 It was a brick dome, covered with concrete, half-covered with dirt, and overgrown by grass, weeds, and trees-of-Heaven. Nothing at all — a simple, rustic construction of mundane materials. Yet for my cousin and me, playing with our dinosaur sets, it became a mountain of cliffs and jungles, a place of infinite tiny, secret places for dinosaurs to hide. Later, for my neighbors and me, it became the Orca, or a similar shark-fishing boat. These notions exist only in our own heads, and (as Chris noted in a comment on the previous posting) they will vanish with us at no loss to the world. But the memories of those imagined things are more important to us than the bricks and the concrete, or any intent of the original builders of the place — our dreams, I would argue, are for us more real than the physical place. They survive, bright and vivid now, though the old cellar is falling to ruin. The barn of our childhood is gone, but it lives in my story “Star,” about the ghost horse, and in our memories. The storm cellar -- cliff of dinosaurs, shark boat, fortress, ski slope, movie location, cave. And does it not seem that memories can be better and more solid even than the realities they’re based on? We take a memory, and we preserve, amplify, and focus it through art (whatever our particular art form may be). Then it has a life far beyond its original instance. I think Matthew Cuthbert from Anne of Green Gables said to Puck: “Could you maybe apologize and not really mean it?” Heh, heh, heh. Dreams not real? — Pshaw, I say! Few things are as substantial and fruitful as a dream. The power of dream is beautiful and devastating. It can wreak ruin or create sanctuary for untold millions. Three cheers for art in its various forms! Three cheers for art, which captures the shining moments as they flow past and makes them come-backable! . . . which finds their meanings, near-eternal as the belt of Orion, true as the light in leaves! And may I take this opportunity to say: a merry and blessed Christmas to all!